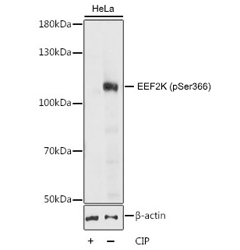 Western blot analysis of HeLa cell lysate untreated or treated with CIP using Rabbit Anti-EEF2K (pSer366) Antibody at a 1/1,000 dilution. Cells were cultured in serum free media overnight before treatment with CIP (20 μl CIP for every 400 μl lysate) at 37°C for 1 hour. 3% BSA was used for blocking. During protein synthesis (translation) messenger RNAs (mRNAs) are decoded by ribosomes into specific amino acid chains, or polypeptides. Regulation of protein synthesis is the key step in gene expression and highly controlled by upstream signaling pathways (Sonenberg and Hinnebusch 2009). Many oncogenes (for example MYC), and tumor suppressors (like TP53) impact the efficiency of the translational apparatus (Bhat et al. 2015). Elucidating the molecular mechanisms, which orchestrate these processes, is therefore crucial for the discovery of new therapeutic targets. Practical tips and tricks with an overview of the importance of SUMOylation in regulating FOXM1 activity. The rate-limiting and most regulated step of translation is the initiation stage. The 43S pre-initiation complex (43S PIC), formed by association of the 40S ribosomal subunit with eukaryotic translation initiation factors, is recruited to the mRNA template with the help of eukaryotic translation initiation factor 4F complex (eIF4F). eIF4F is composed of the 5’ mRNA cap binding protein (eIF4E), the scaffolding protein (eIF4G) and RNA helicase (eIF4A) (Bhat et al. 2015 and Hinnebusch 2014). Interestingly, the same binding site on eIF4E that interacts with eIF4G to form the complex also binds to unphosphorylated 4E binding proteins (4E-BPs). Therefore, 4E-BPs compete with eIF4G for binding to eIF4E. However, upon phosphorylation by the serine/threonine protein kinase mTORC1, 4E-BP is no longer able to bind to eIF4E. This creates unbound eIF4E and thereby enables eIF4F complex assembly through eIF4E-eIF4G binding (Figure 1). eIF4E is phosphorylated at serine 209 by MAPK signal-integrating kinase 1 (MNK1) and MAPK signal-integrating kinase 2 (MNK2) (Scheper et al. 2001). eIF4E phosphorylation at serine 209 targets the eIF4E for small ubiquitin-related modifier (SUMO1) conjugation. Conjugation to SUMO1 (or SUMOylation) enhances eIF4E and 4E-BP1 dissociation and promotes the formation of the translationally active eIF4F complex (Xu et al. 2010). Fig. 1. Mammalian target of rapamycin (mTOR) complex 1 (mTORC1) phosphorylates 4E-BP proteins and stimulates translation through formation of eIF4F complex. MAPK-interacting kinases (MNK1 and MNK2) regulate eIF4E by phosphorylation at serine 209, which promotes eIF4E SUMOylation. S6K kinase, in addition to 4E-BPs, also mediates the effects of mTOR on translation rates. Phosphorylation of eukaryotic elongation factor 2 kinase (EEF2K) at serine 366 inactivates EEF2K. This results in EEF2K no longer being able to phosphorylate eukaryotic elongation factor 2 (eEF2) (Wang et al. 2001). Unphosphorylated eEF2 can bind to ribosomes resulting in increased elongation rates and more protein synthesis (Figure 2A). Adenosine monophosphate-activated protein kinase (AMPK) counteracts mTOR activity through phosphorylation of EEF2K at serine 398, which activates its kinase activity (Figure 2B). This event increases eEF2 phosphorylation and reduces protein synthesis rates (Browne et al. 2004). Fig. 2. mTOR signaling and its impact on the regulation of translation. A, mTORC1/S6K axis phosphorylates eEF2K at serine 366. This phosphorylation inactivates EEF2K, which in return is no longer able to phosphorylate eEF2. Unphosphorylated eEF2 can bind to ribosomes. B, AMPK phosphorylates eEF2K at serine 398, which results in its activation and subsequent phosphorylatation of eEF2 in turn at threonine 56. This phosphorylation inhibits eEF2 binding to ribosomes. (Figure adapted from Holz and Blenis 2005, Lindqvist et al. 2018, and Wang et al. 2001). In summary, mTOR signaling is a key for the orchestration of translation complex formation and ultimately translation. Please use the buttons / filters to help you find the antibody that fits your exact requirements. If you need any further assistance please do not hesitate to contact us. Bhat M et al. (2015). 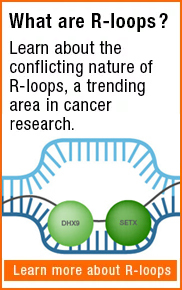 Targeting the translation machinery in cancer. Nat Rev Drug Discov 14,261-78. Browne GJ et al. (2004) Stimulation of the AMP-activated protein kinase leads to activation of eukaryotic elongation factor 2 kinase and to its phosphorylation at a novel site, serine 398.J Biol Chem 279, 12220-31. Hinnebusch AG (2014). The scanning mechanism of eukaryotic translation initiation. Annu Rev Biochem. 83, 779-812. Holz K and Blenis J (2005). Identification of S6 kinase 1 as a novel mammalian target of rapamycin (mTOR)-phosphorylating kinase. J Biol Chem. 280, 26089-26093. Linqvist LM et al. (2018). Cross-talk between protein synthesis, energy metabolism and autophagy in cancer. Curr Opin Genet Dev. 48, 104-111. Sonenberg N and Hinnebusch AG (2009). Regulation of translation initiation in eukaryotes: mechanisms and biological targets. Cell 136, 731-45. Wang X et al. (2001). Regulation of elongation factor 2 kinase by p90(RSK1) and p70 S6 kinase. EMBO J. 20, 4370-9. Xu X et al. (2010). 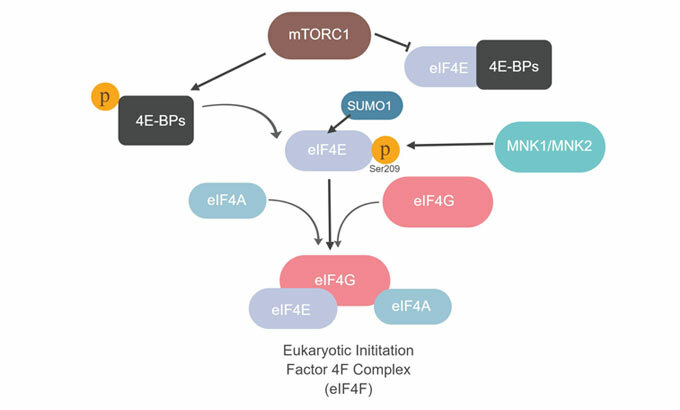 Sumoylation of eIF4E activates mRNA translation. EMBO Rep. 11, 299-304.